So, let's talk cinnamon. I love it. It's probably my favorite spice. I totally associate it with all the comfort foods of my childhood. There are so many memories like Mom's coffeecake that she made when company was coming over as well as her pineapple upside cake, and there was te de canela (cinnamon tea made from Mexican cinnamon), cinnamon-sugar crispy tortillas (known as bunuelos), cinnamon-sugar topped hot buttered toast, Mexican hot chocolate, horchata during the hot summer months, and Mexican sweet rice. There was also Dad's french toast, his pan de pan (a Mexican bread pudding made with days old bread, sugar, raisins and pineapple) and of course all of the treats of the holidays including apple pie and pumpkin pie. There's also this cookie recipe that I used to make often during high school for cookie exchanges around the holidays. It's been so long now since I first made it that I don't remember where the original recipe came from. Probably from a copy of my mother's Ladies Home Journal. I haven't made this cookie in years and when I was trying to come up with a special cookie to make for this year's Great Food Blogger Cookie Swap, it was the recipe I kept coming back to. 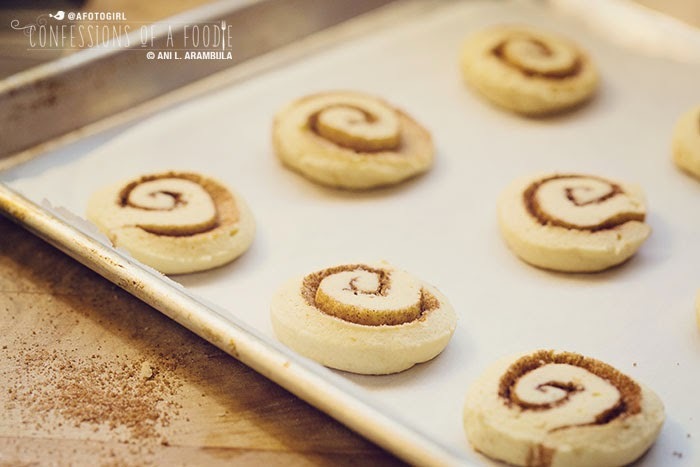 I love how these little guys hit all my favorite notes of a cinnamon bun but in cookie form so they're quicker with no waiting for a yeasty dough to rise yet are nonetheless satisfying. This was the first time topping them with the icing. 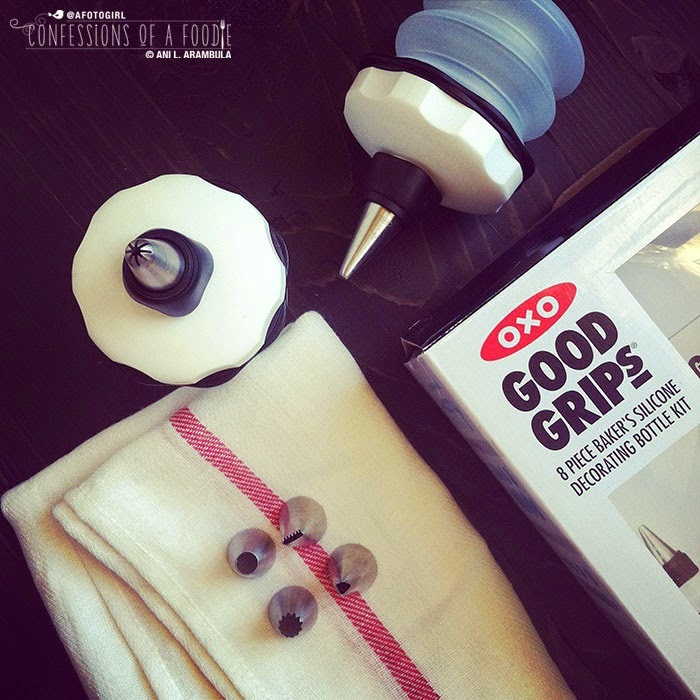 I was encouraged to add the icing after receiving a really cool new thank you gift from OXO for participating in the swap: a cookie decorating kit. I love how the addition of the icing really completes the mini cinnamon bun look and taste. These little bites are totally satisfying. Easy to make. Look impressive and are always a hit. I hope you consider making them for your next cookie exchange. 1. 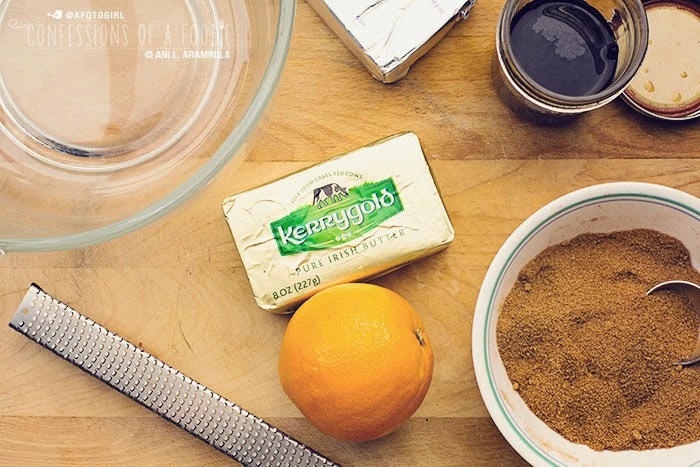 Stir together brown sugar and cinnamon in a small bowl are cup; set aside. 2. Beat butter and cream cheese together in a large mixing bowl with an electric mixer until light and fluffy. Add the sugar and beat again for 2 minutes, scraping down the sides of the bowl as needed. Crack one egg into a cup, then add and beat until fully incorporated. Repeat with second egg. Add the vanilla and zest and beat on medium until fully incorporated, 1-2 minutes; set aside. 3. Sift together the flour, baking powder, baking sugar and salt into a medium bowl. Add a third of the flour to the butter mixture and mix with the electric mixer. Add the next third also mixing with the electric mixer. Finally, add the last third, this time using a wooden spoon or rubber spatula. 4. Dust a dry work surface with flour and turn out the dough onto the work surface. Flour hands as needed and need the dough until it holds together and is no longer overly sticky, adding additional flour as needed. 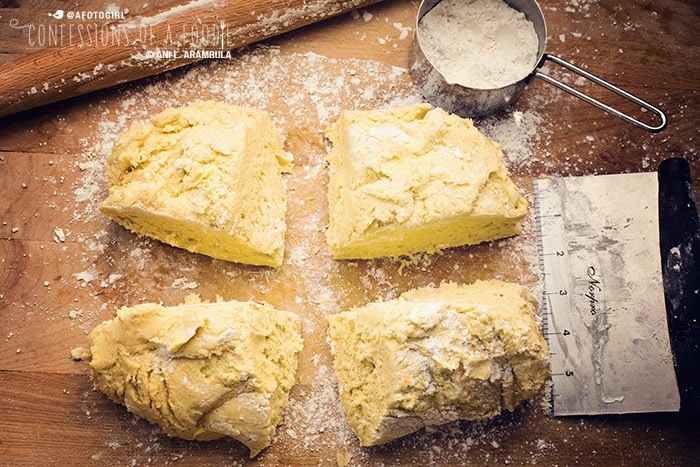 Pat into a large disc and divide the dough into four equal portions. Shape each portion into a flat disc and cover tightly with plastic wrap. Refrigerate for 15 minutes. 5. Place a large sheet of cooking parchment or waxed paper on work surface. Dust parchment and rolling pin with flour. Working with one disc at a time (leaving other discs in refrigerator until ready), roll out the disk into approximately an 9-inch x 8-inch rectangle. 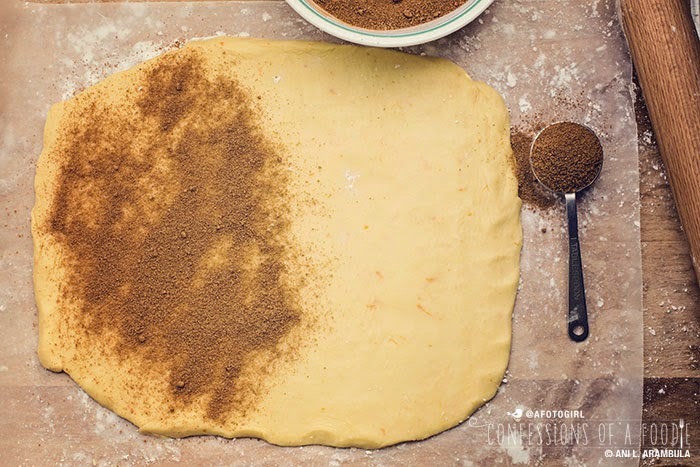 Sprinkle the surface evenly with ¼ of the cinnamon sugar. 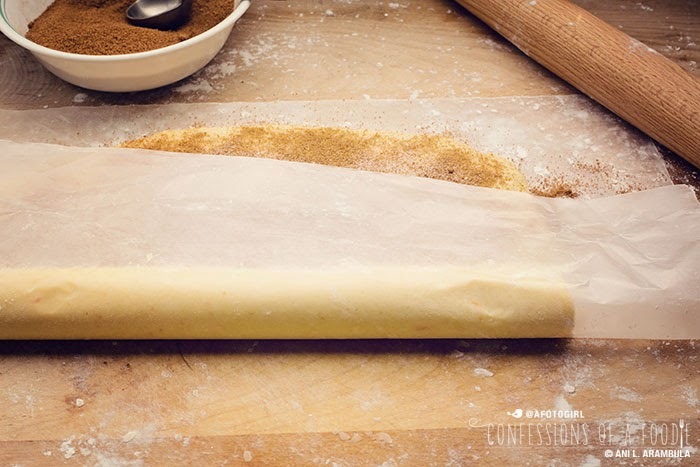 From the long side, carefully pull the parchment away from you, rolling the dough onto itself. 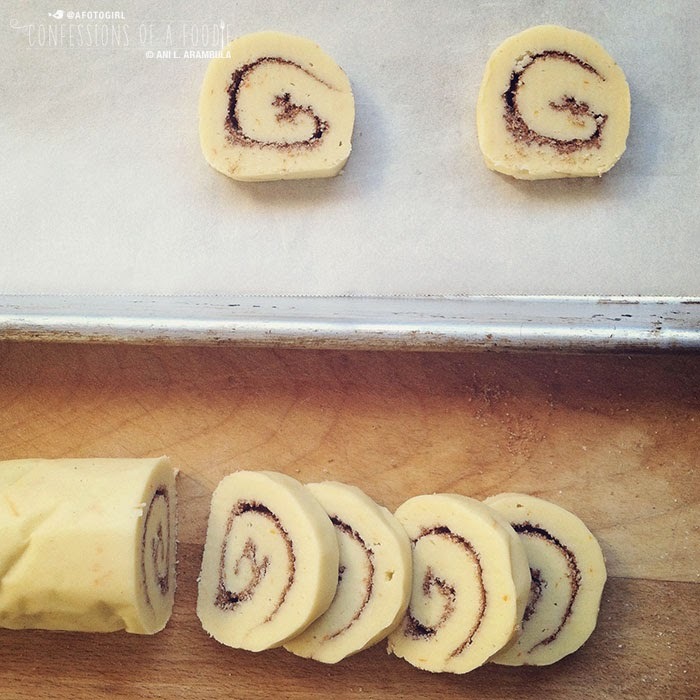 Continue rolling and coaxing the dough into a jelly roll when you reach the other side, pull the paper back and check that the dough is tightly rolled. Coax the roll towards you and roll it back up in the parchment, burrito style, pinching the ends closed. Return t the refrigerator and repeat with remaining discs. 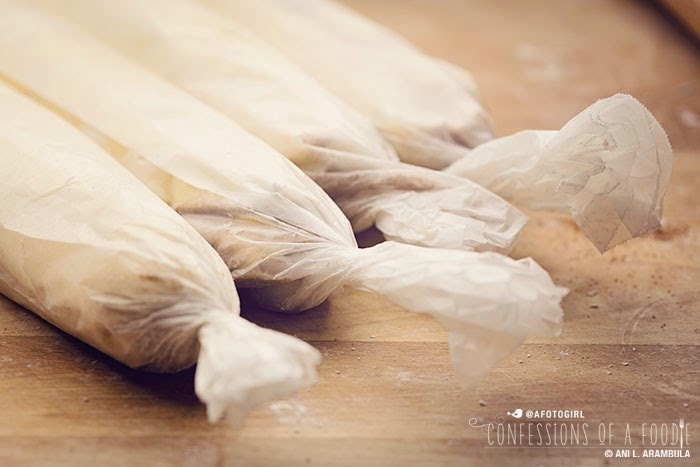 Allow dough to chill for at least two hours or overnight. 6. When ready to bake, preheat oven to 350 degrees Fahrenheit. Line two rimmed baking sheets with kitchen parchment. 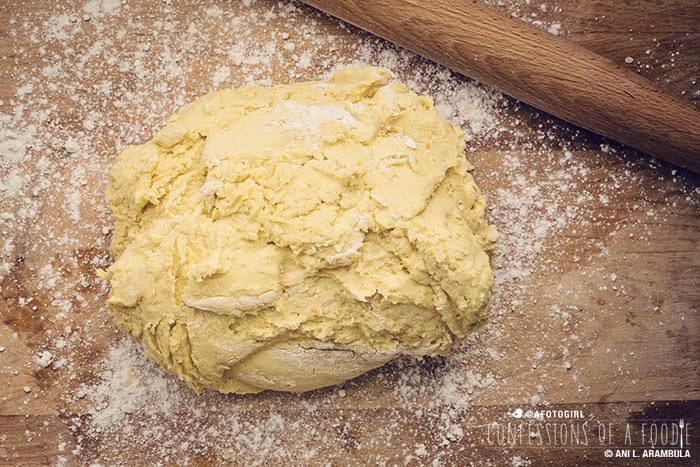 Remove one roll of dough from refrigerator and slice dough into about ⅜ -inch thick rounds. 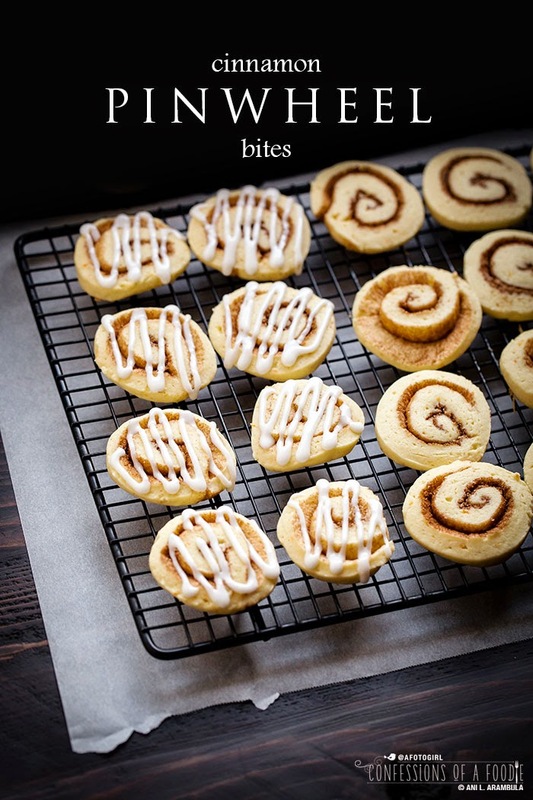 Place cookies one inch apart on baking sheet. Bake for 9 minutes then remove cookies from oven and allow to rest in pan for 2 minutes before removing to cooling racks. Repeat with remaining rolls until all cookies are baked. Allow cookies to cool completely before icing. 7. For icing, combine all ingredients in a small bowl, adding more milk as needed to thin out to desired consistency. I thinned mine out to the consistency of pancake syrup. There are a couple of ways to decorate your cookies: a) simple drizzle the cookies using a teaspoon, b) pour the icing into a ziplock or disposable pastry bag, snip the end and pipe the icing on the cake, or c) fill a cake decorating bottle fitted with a small round tip and decorate the cookies. This icing will harden enough to stack the cookies without them sticking to each other. Store cookies in an airtight container for up to four days at room temperature or up to a week in the refrigerator. Come back Wednesday and I'll have a more diabetic-friendly version to share with you. It has a slightly different texture, to be sure, but still quite tasty and satisfying. If you have no issues with sugar or white flour, than this recipe is perfect just as it is. Until next time ... Happy baking, friends! These were so cute and expertly wrapped! I felt like they were straight from a store with how well they were packaged. And so tasty too. It looks so tasty! But I think that this recipe should take a lot of time, right? I think I lack patience in such situations. 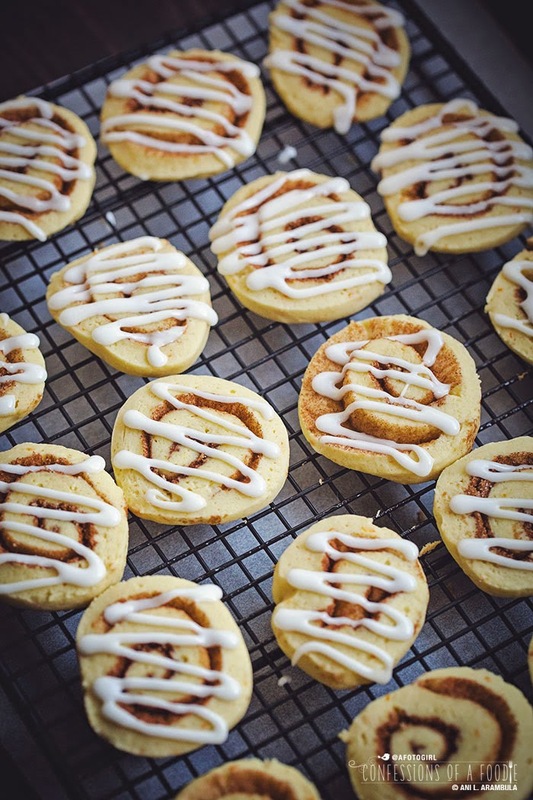 Hi, To make the pinwheel cookies in a vanilla and chocolate combination, divide the dough into two parts. ... Cool slightly, and mix the chocolate into one half of the dough until well blended.